Total Body Training On The Cable Machine! 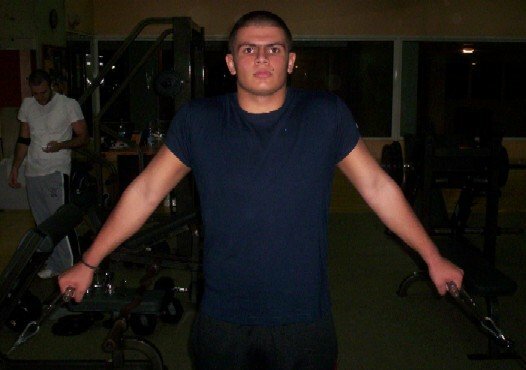 I have devised a full-body program, to be performed entirely on the cable machine. Please realize that this is not intended for substantial gains in muscle, but instead as a needed departure from your normal routine. Check it out! 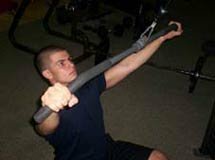 People rarely perform more than the occasional drill or two on the cable machine, not realizing that they can perform a full body workout on this versatile machine. 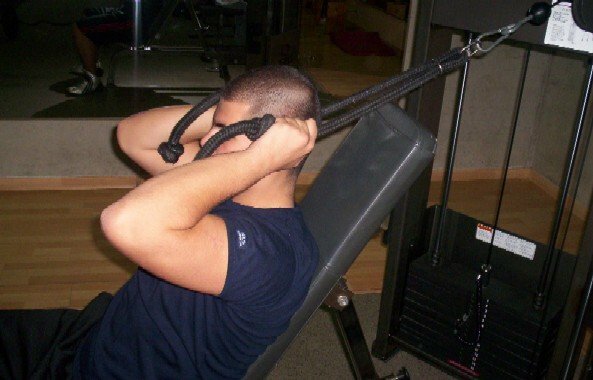 In the light of that, I have devised a full-body program, to be performed entirely on the cable machine. You have to realize that this is not intended for substantial gains in muscle, but rather as an often needed departure from your free weight or machine-based routine. Diversity and variations are necessary implementations to your training routine, and this program should provide you exactly with that. Don't forget to consult your physician before starting any exercise program. 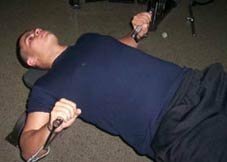 Cable Press 3-4 8-12 Lying on the flat bench, head straight, feet shoulder-width apart, palms facing forward, arms straight. Hands next to the shoulders and elbows bent. Standard cable hand grips. Cable Press (Start and Finish). Incline Cable Flyes 3-4 8-12 Lying on the Incline Bench, palms facing each other, arms straight. A quarter-circle has been drawn with each hand. Elbows slightly bent. Standard cable hand grips. Incline Cable Flyes (Start and Finish). Cable Crossover 3-4 10-12 Standing, feet shoulder-width apart, knees slightly bent, torso slightly leaning forward, arms straight and laterally raised palms facing downward. Arms are the same as in the starting position, palms brought together. Standard cable hand grips. Cable Crossover (Start and Finish). 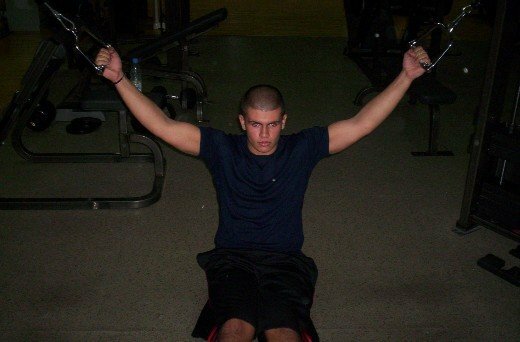 Pullovers 3-4 8-10 Lying on the flat bench, head straight, feet apart, palms facing forward, arms straight. Grip behind your head. Arms slightly bent. Straight medium size grip. Bent-Over Rows 3-4 8-12 Standing bent-over, feet shoulder-width apart, knees bent, back straight, palms are facing forward (reverse grip). Elbows bent. Grip touches the sternum. Straight medium size grip. 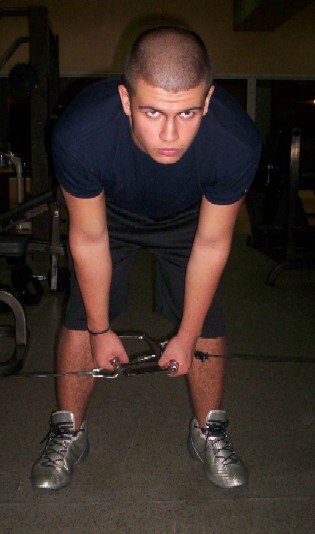 Bent-Over Rows (Start and Finish). Lat Pulldowns 3-4 10-12 Seated, upper back is slightly leaning backward, palms facing forward, arms straight. Elbows bent. Grip touches the upper chest. Standard wide Lat grip. Lat Pulldowns (Start and Finish). 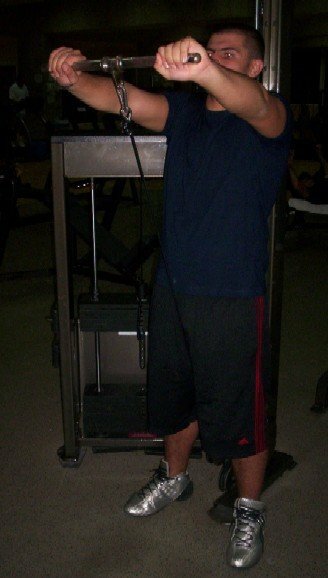 High Pulley Pulldowns 3-4 8-12 Seated, back straight, palms facing each other, arms straight. Elbows bent. Grips next to the shoulders. Standard cable hand grips. High Pulley Pulldowns (Start and Finish). 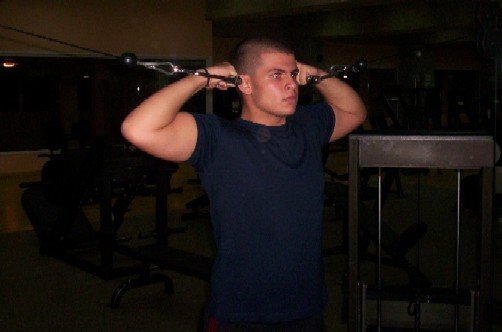 Straight Arm Pulldowns 3-4 12-15 Standing, feet shoulder-width apart, torso leaning forward, arms straight, palms are facing your body. Grip brought towards the pelvis. Straight medium size grip. Lateral Raise 3-4 10-12 Standing, feet shoulder-width apart, knees slightly bent, back straight, arms slightly bent at the elbows, palms crossing each other. Hands at shoulders height. Standard cable hand grips. 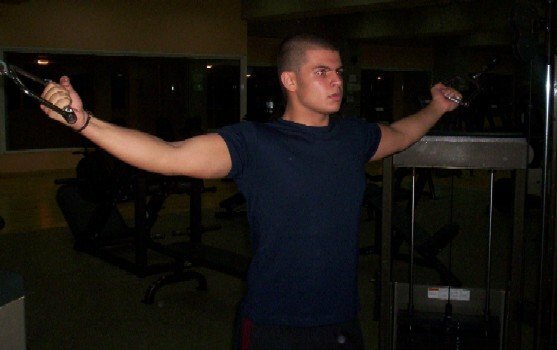 Lateral Raise (Start and Finish). Front Raise 3-4 10-12 Standing, feet shoulder-width apart, knees slightly bent, arms straight, back straight, palms facing your body. Hands at eye level. Straight medium size grip. Front Raise (Start and Finish). 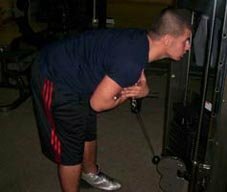 Bent-Over Laterals 3-4 12-15 Standing, feet shoulder-width apart, knees slightly bent, torso is perpendicular with your legs, back straight, arms slightly bent at the elbows, palms crossing each other. Hands aligned with your head. Standard cable hand grips. Bent-Over Laterals (Start and Finish). Upright Rows 2-3 8-12 Standing, feet shoulder-width apart, knees slightly bent, back straight, palms facing your body. Elbows bent. Grip brought up to your chin. Straight medium size grip. 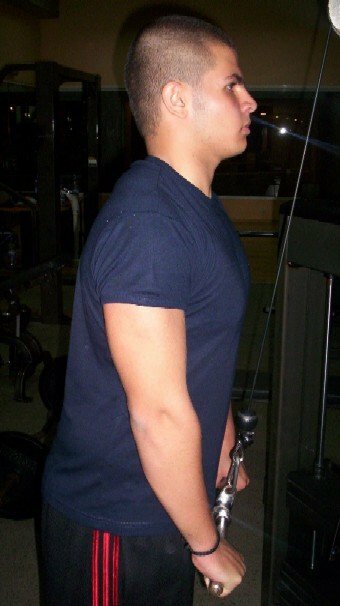 Shrugs 2-3 8-12 Standing, feet shoulder-width apart, arms straight, knees slightly bent, back straight, palms facing your hips. Shoulders lifted straight upward towards the ears. Standard cable hand grips. Click Here For A Printable Log Of Deltoids. 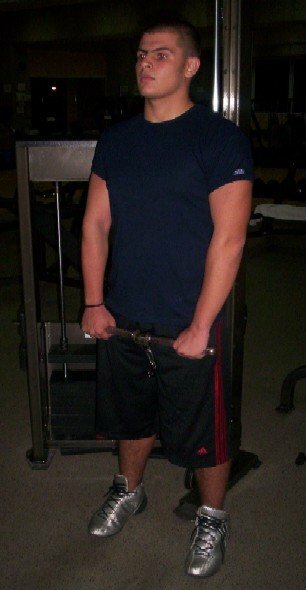 High Pulley Curls 3-4 8-12 Standing, feet shoulder-width apart, knees slightly bent, back straight, palms facing each other, hands laterally raised at shoulder level. Hands brought toward your ears. Standard cable hand grips. 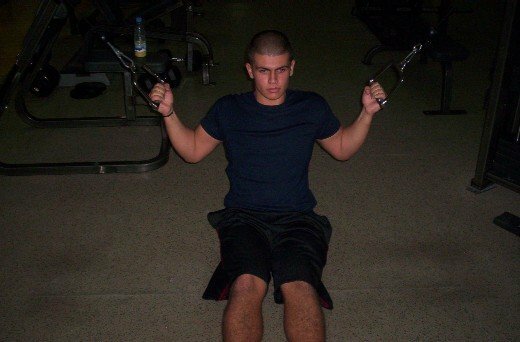 High Pulley Curls (Start and Finish). Lying Curls 3-4 8-12 Lying, head straight, feet apart, palms facing backward, arms straight. Elbows bent. Grip brought to your head. Straight medium size grip. Preacher Curls 3-4 8-12 Seated on the Preacher or Scott Bench, back straight, palms facing forward. Elbows bent. Hands toward your chin. Straight medium size grip. Lying Extensions 3-4 8-12 Lying, head straight, feet apart, arms straight above your chest, palms facing forward. Hands lowered to head level. Straight medium size grip. Cable Press Downs 3-4 10-12 Standing, feet shoulder-width apart, torso slightly leaned forward, back straight, knees slightly bent. Arms straight. Hands in front of your pelvis. Straight medium size grip. Cable Press Downs (Start and Finish). One Arm Reverse Pushdowns 3-4 12-15 Standing, one leg forward, knees slightly bent, back straight, grip is reversed. Arm straight next to your hip. Standard cable hand grip. Cable Crunches 3-4 15-25 Kneeling, rope next to the ears. Back straight. Elbows bent and parallel. Elbows brought toward the floor. Rope. Cable Crunches (Start and Finish). 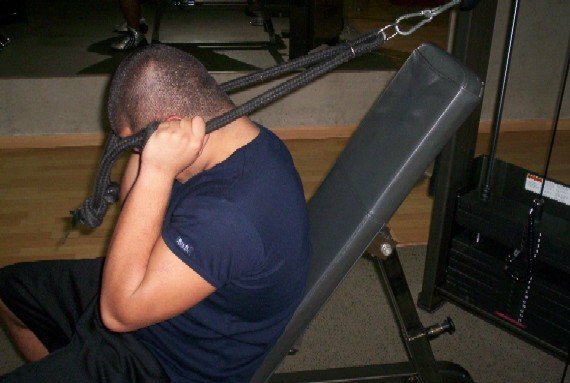 Incline Bench Cable Crunches 3-4 15-25 Seated on the incline bench, rope next to the ears. Back straight. Elbows bent and parallel. Elbows brought toward the floor. Rope. 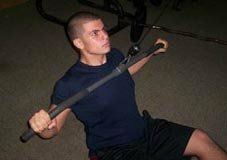 Incline Bench Cable Crunches (Start and Finish). Leg Raises 3-4 10-15 Lying, legs raised at 45 degree angle, knees are slightly bent, hands placed under the lower back if necessary. Thighs perpendicular to your upper body. Ankle belt. Straight medium size grip. Leg Raises (Start and Finish). Leg Raises: How To Fix The Grip. Back Extensions 3-4 10-12 Standing, feet shoulder-width apart, knees are slightly bent, grip placed between your bent arms, back straight. 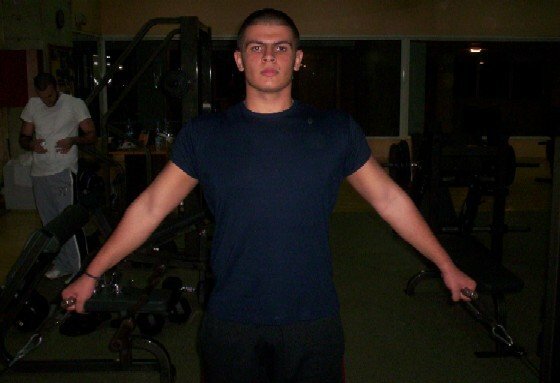 Chest parallel to the floor. Straight medium size grip. Back Extensions (Start and Finish). Click Here For A Printable Log Of Abdominals/Lower Back. The Altus Ankle Strap is a new, efficient way to tone and tighen hard to work problem spots like you hips, upper thighs and buttocks. Squat 6-8 10-15 Standing, knees are slightly bent, back straight, holding the rope on your shoulders and fixing it on your chest. Hamstrings parallel to the floor. Rope. 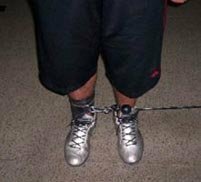 Cable Hip Abduction 2-3 10-15 Standing, feet together, hold machine frame for stability. Feet lifted sideways straight upward. Ankle belt. Cable Hip Abduction (Start and Finish). Cable Hip Adduction 2-3 10-15 Standing, feet 10 inches apart, hold machine frame for stability. Feet together. Ankle belt. 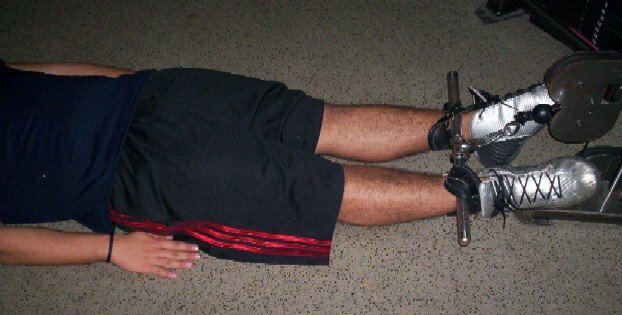 Cable Hip Adduction (Start and Finish). Click Here For A Printable Log Of Legs/Hips. 1 Pectorals, Legs, Abdominals/Lower Back. 5 Deltoids, Legs, Abdominals/Lower back. It's up to you to choose the weight that you feel comfortable with. If you are a beginner, typically start with a minimum weight or a few plates and gradually increase the load as you progress. Plan on being reasonably tired after each set. If you can comfortably add repetitions, then the resistance level is too low. Rest time between sets and exercises must be 30-90 seconds depending on your conditioning level. Increase the weight or load. Use advanced training techniques such as: Drop sets, Exhaustion Sets, Pyramids, Burn System, Super Slow System, Super Sets, Compound Sets, etc. For more information about advanced training techniques, you may refer to my other articles. A recent release was Total Body Training With Only A Barbell, another total body routine with a single (great for home gyms) instrument. Total Body Training With Only A Barbell. This is total body training. The nice thing about this is you can do it all with just a barbell. This in-depth article explains the program and exercises in detail.